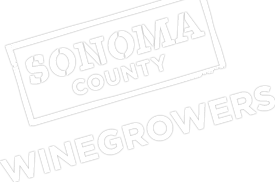 On this week’s show Karissa welcomed to the studio Kevin Barr, Co-Owner of Redwood Empire Vineyard Management and Lise Asimont, Director of Grower Relations at Francis Ford Coppola Winery. During the show, Kevin Barr shared his passion for farming and grape growing and explained the process it took to make Redwood Empire Vineyard Management the first and only (to date) Certified Sustainable vineyard management company in all of California through the California Sustainable Winegrowing Alliance. Kevin also described how proud he is to work alongside so many talented vineyard owners throughout Sonoma County and support the sustainability efforts of the Sonoma County Winegrowers. As one of the emerging leaders in winegrowing, Lise Asimont was the recent recipient of the Sonoma County Harvest Fair’s 2014 Outstanding Young Person in Agribusiness Award. She described her love of farming and grape growing and discussed working with Redwood Empire Vineyard Management, who manages several vineyards they purchase fruit from each year. She also shared some wines from Francis Ford Coppola Winery and their winegrowing and winemaking philosophy. The group also discussed some of the important families and leaders that have helped shape Sonoma County’s legacy as a winegrowing region.